Yeah, I know, a boring title, but I didn’t know what else to title it and still reflect how I feel about this clinic. My dear phobic daughter Molly went thru 4 extractions and 4 implants earlier this week. She had to have IV sedation to do it due to her extreme anxiety. Knowing she will have to come back here in 3-5 months for the crowns, I’ve been so worried about her being able to handle it. She can’t expect IV sedation for crown fittings, it’s just not going to work that way. So, I spoke with one of the younger dentists at Dr. Cavallini’s office, Dr. Alvaro to see if Molly could come down (our hotel room is upstairs from the clinic) and just talk with him, no pressure, no dentistry, just talk. Well, he did so much more than that. Molly and I came into an exam room and she stood there while he took the time to show her instruments, explain to her what would be involved with a crown, let her hold instruments, asked her about her fears all with such remarkable kindness and calm, she was terrified. After about 10 minutes, he asked if she would like to have her teeth cleaned by one of the dental assistants (who was there the entire time) and my daughter agreed! The assistant was also kind and patient and showed my daughter the paste, the cleaning pad for the drill and all in all, I am so very impressed. My daughter left the office with a far different attitude and I’m sure a lot less weight on her shoulders. Bravo to the wonderful professionals at this clinic, bravo…you’re the best! 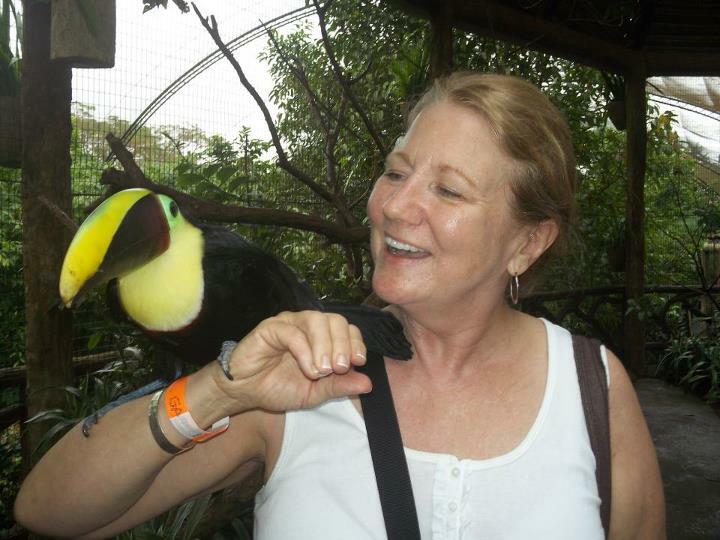 So, we spent a day or so touring, went to La Paz Waterfall gardens and animal sanctuary. Getting away from the clinic and San Jose does wonders for the psyche! We went with a woman and her daughter from Virginia (the mom was also a dental patient) We hired a private driver for the day, which was a little less costly than taking an organized tour and definitely a lot of fun, we learned some unique spanish terms for the most ordinary things! La Paz is about a 90 minute drive from San Jose, dirt roads, hills, thru quaint towns and nestled in the rain forest. A beautiful place to spend a day! It’s hard to say what we enjoyed the most. 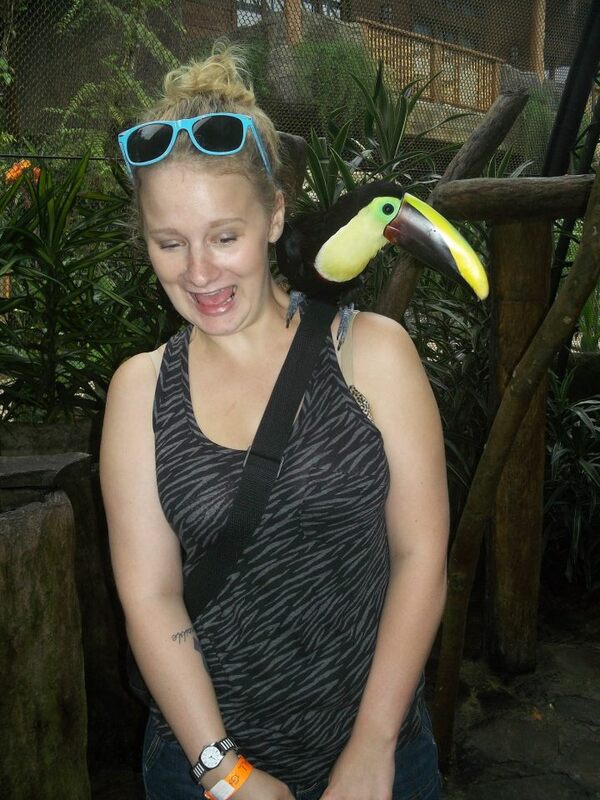 First stop was the aviary, where we got up close and personal with toucans! It was amazing how the handler managed to hold a tiny piece of kibble in his mouth and the toucan was able to gently get the kibble with that long beak. Best the handler try that, not us! As you can see from the smiles, it was a nice reprieve from dental work! The end of the day we found ourselves in the waterfall gardens, a beautiful walk through the rainforest and up close to the falls. The air was so fresh! 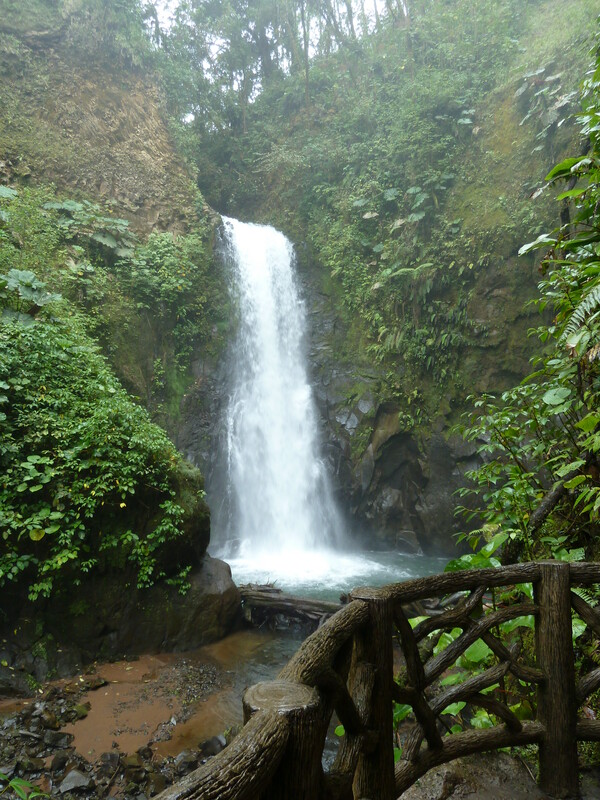 I usually have sinus problems, which always seems to go away in the Costa Rica Rain forest. Tomorrow is our last day here. I plan to take my daughter to the Mercado Artesania in San Jose where she can see a lot of locally made items and maybe pick up a few things. I picked up a fabulous cutting board while there earlier this year, it’s something I use every day at home, I just love it. Haggling at the mercado is expected, Tico’s do it all the time, so we will too. We won’t expect the merchants to give the stuff away but just like the Tico’s, we’ll enjoy the banter and everyone enjoys feeling like they got a great deal! Busy day tomorrow, so for now, I’ll say Buenas noches. Foodie, Traveler, enjoying this midway time of life. My cats own me. My first guest post! Foodie Penpal Reverse Reveal!